Why Restaurants and Bars up and down the country increasingly choose to use Rostrons Food and Drink Waiters Pads. 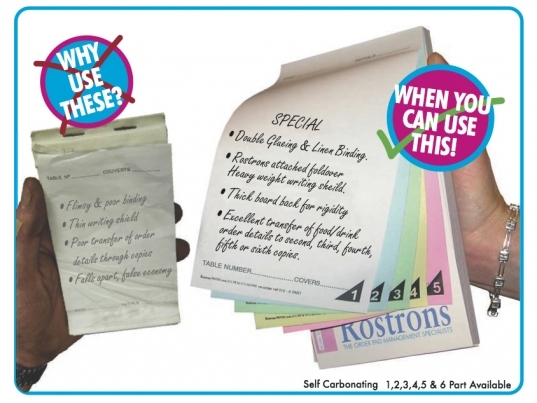 All Rostrons Food and Drink pads are made using NCR Self Carbonating paper - NOT old fashioned sheets of carbon paper. Using The Rostrons Food and Drink Waiters Pads to further enhance the enjoyment of taking your customers order even more is what many Restaurants and Bars up and down the country are choosing to do. We have listened to what the dedicated user at the Restaurant, Bar, Hotel requires in the Waiters food and drink Order/Check Pad. Be it Self Carbonating 1,2,3,4,5,6 ply or 1 Ply Cafe Pads. That's why there is such a wide range that we now manufacture which have so many outstanding features making them probably the Best Quality Waiters Pads available and British Made too. Double Glued & With A Linen Reinforced Binding Edge. Thick Inner Board Back which keeps the Pad rigid when down to the last few sets. Top Quality Paper 70/80gsm used. Wording on the pads as requested by Restaurants, Bars and Hotels as requirements are varied for different establishments. 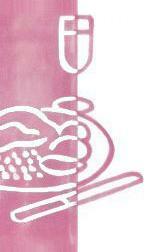 The print is not too small and is clear and sharp and only vegetable based printing inks are used. Different coloured Pads available for different Bar areas so accounting and sorting for billing the client is made easily. Varied sizes for ease of use. ie. Fitting in shirt pocket, ease of handling or an extra large italian style long pad for taking large parties orders. Unique triangle with the copy number in the bottom right corner for ease of inserting the correct amount of sheets in the writing shield. A Nice looking Tidy well Manufactured pad that does not look out of place in your nice establishment which looks clean and neat when on display either at the Till check out or Behind the Bar and when being used by the Waiter. Superb value for the quality and not false economy as it delivers the order to the Kitchen or Bar and accounts for everything to be charged for at the till check out so you Bill the full amount due and not so as often happens a free wine misses been paid for. That's why appraisals and nice feed back to Rostrons are many and we are so pleased to have so many satisfied happy clients in the hospitality industry, but we will still keep listening and enhancing to meet the varied needs of our clients.